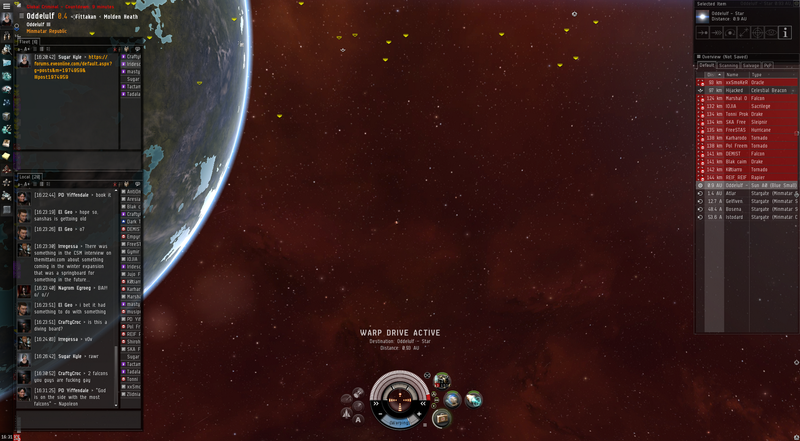 Live Event: Angel Cartel conduct planetary attack in Oddelulf! BREAKING NEWS: MOLDEN HEATH PIRATES REPRESENT AND KILL ALL THE THINGS! It seems that CCP had a live event today. I logged in and in one channel some of the guys were chattering about an event going on in Oddelulf. I was not sure if serious. A live event, in low sec and in Molden Heath? Wat?! This is the 'news' story of the event. I jumped into a Jaguar to go and see if this was a real thing or random lies. As I ran towards Oddelulf I got this link to a forum thread about it. And a website about Tech 4 News? How cool. Masty and Crafty were killing all the things. I pushed my Jag and hopped into system while asking for a fleet invite. I decided to land far out so that I had some room to take in what was going on. Local was crazy with 45 people in it. All sorts of stuff was on the field and I think people were killing NPCs. Whatever. Pewpew! I decided to try to chase down a rifter that I hoped was not paying attention. However, he noticed and got into warp just as I hit my scram! Damn it! Next! The field was flowing back and forth with people. I buzzed about and attempted to get a warpin on people for the RANSM boys to come in and do more beating. My goal was simple. Tackle all the things. 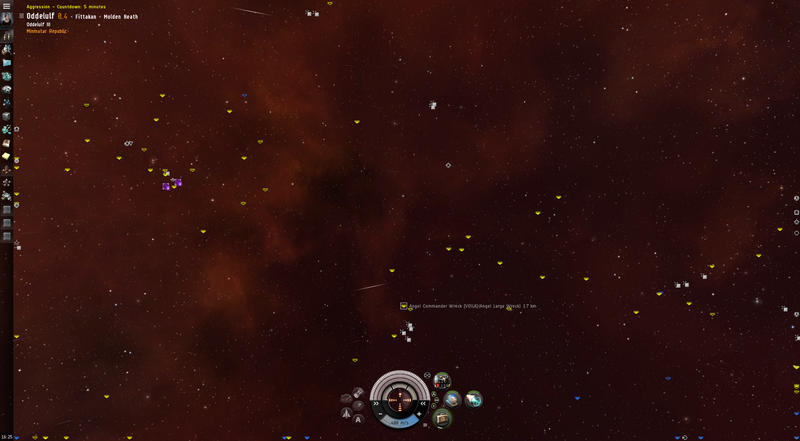 They were regrouping and trying to probe down a fleet that was somewhere in system with a safe. Having chased down several ships to have them run, someone in a noob ship landed right on top of me. With my mighty Jaguar I went "ROAR!" as I tackled and destroyed it. For a moment it was very quiet. Space ship wrecks errywhere. I was trying to chase down something or another. Then more people started to roll in. I got called to the sun. While we went to regroup and see if we could get back on field. 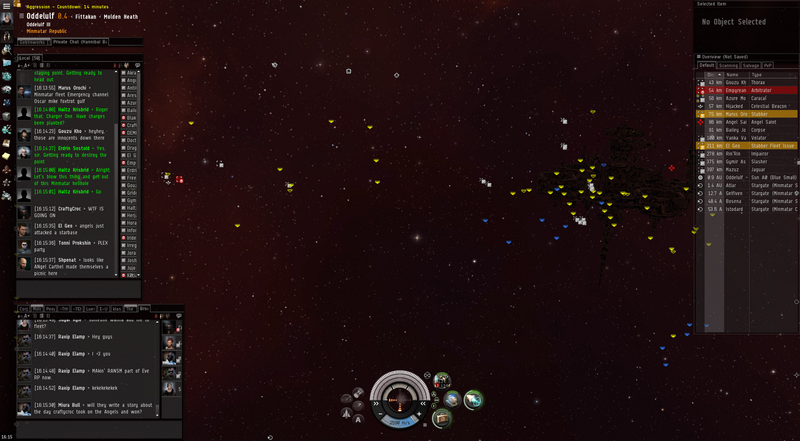 There were four of us (Domi, Domi, Maelstrom, Jaguar) and a whole fleet of them. We landed around 70k off of them. That was just too far. They tried to alpha my Jaguar but again it was too mighty! While the Maelstrom started to pewpew at them I warped off and tried to get a better reentry angel to maybe land on a Falcon. But it was to no avail. They managed to take down the proud pirate warriors of RANSM and Crafty fell after tanking over 247k of damage in his Maelstrom because he is a badass. We were just not able to get the people and positioning to break their fleet and open up the situation. Very frustrating. The forum thread we updated with our glorious destruction but the forum admins deleted it. It was not in their RP mode I guess. Very sad. I also make the assumption that they don't want people to not come to the low sec events because of the entire pirate contingency. But that is sooo Eve! Live Event that turns out to be a Dust 514 promotion is attended by players and interrupted by pirates. 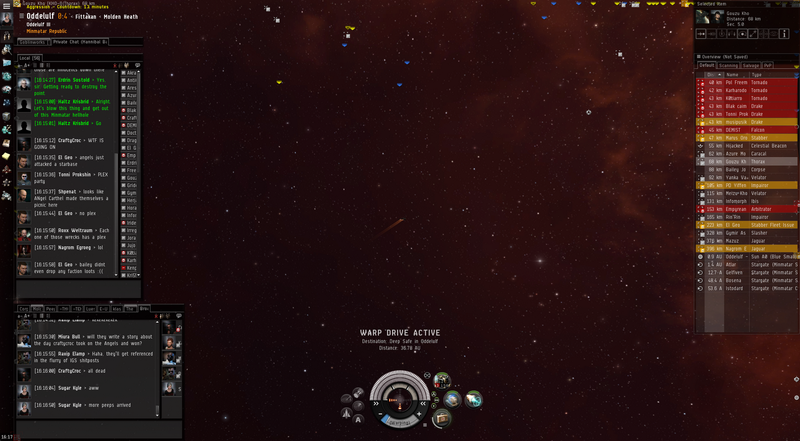 We had pretty much no idea as to what was going on other then bodies in low sec, undock and kill everything. This is the Kingdom of Yarr. Welcome. Small Aside: I had a nice visit from a blog reader yesterday and a good chat. I appreciate the support, advice, and suggestions that I have received to improve my blog and make it a more pleasant experience for those that are kind enough to keep up with my ramblings. Edit to add: Turns out that forum section is a role play section. Never looked at it before. Who knew. Oh well. All the things are still exploded. I know, huh? 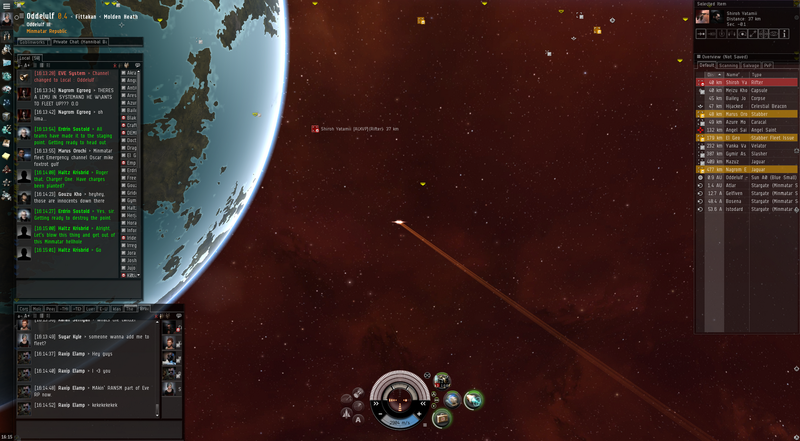 :Roleplaying: in an MMO about big spaceships, and huge spaceship battles? I thought that was just everyday life ... prob was A Long Time Ago, In a Galaxy Far, Far Away.